Cancer registries combine technology and human know-how to present cancer data in a whole new light. As medical records continue to evolve into electronic health information, the processes of cancer registries are changing in parallel. Although much paper remains, registries have made progress in driving toward automation and electronic communication. The cancer registrars who capture summaries of the history, diagnosis, treatment, and disease status of patients in their databases rely, in varying degrees, on both paper and electronic records. They also receive and send data both electronically and by “old-fashioned” means of mail, phone, and fax depending on the status of their hospitals’ electronic environment, organizational structure, and patient population size. The registry database also tracks treatment and follow-up information from outside providers, but this information is not obtained electronically. Caro sends a form letter provided by the CNEXT software and receives paper records in return. On a regular basis, she uses CNEXT to secure data in a zip file and transmits it via e-mail to the Los Angeles County Cancer Surveillance Program, one of the state’s 11 regional registries. Each year, she receives a disk with comparative demographic, site, and staging data from the regional registry, which can be used to benchmark the hospital against other Los Angeles County facilities. Regional registries such as the Los Angeles County Cancer Surveillance Program perform quality control checks on data submitted by hospital registries before submitting them to the state registry. In turn, the state registry performs its quality control checks before submitting the data to the national registry. “Each registry does its own quality review and gives feedback to the reporting entity,” says Caro. “That way, the data is triply quality controlled.” Submissions from registry to registry are electronic. Larger hospitals usually have several CTRs who are networked within the department. That is the case at City of Hope, a comprehensive cancer center in Duarte, Calif., where cancer registry administrator Ina Ervin, CTR, manages six CTRs and one assistant who are networked within the registry. Because the hospital’s EMR is only 75% complete, registrars rely largely on patient charts. Patient follow-up data are requested from outside providers using the form letter produced by the state-provided CNEXT software. Ervin transmits data to the Los Angeles County Cancer Surveillance Program electronically via CNEXT twice per month, including follow-up on previously submitted information. In turn, the regional registry provides follow-up information on disk twice per year on City of Hope patients who have seen other providers. The disk automatically updates the CNEXT record. To submit information to the National Cancer Data Base, Aurora sends an error-free electronic file directly from its registry via the organization’s Web site. “Our Web-based system allows us to upload each hospital’s file from a single location if we wish,” says Robinson. The national statistics obtained in return are used for benchmarking to other Commission on Cancer-approved programs in the United States and for internal quality improvement studies. Survival statistics are obtained from tracking patients for their lifetimes as they receive treatment within and beyond Aurora. Aurora has a better than 95% follow-up rate for all patients within the database. For those patients still being seen within the system, electronic merges from the data warehouse help eliminate the manual search process for recent dates of contact. For those patients who are being seen outside of the system, Aurora does not yet have electronic systems in place to collect the information. “Registries reciprocate information on shared patients on a regular basis, either by phone inquiry or letter,” says Robinson. “Although this sharing of information is very important for accurate recording of all treatment, some registrars fail to recognize that it is permitted under several HIPAA exemptions.” Because Aurora’s registry collects information from outside the organization, its registry database is maintained separately from the EMR. Once Aurora’s EMR is complete, Robinson plans to investigate artificial intelligence software to perform some registry functions in hopes that it will free up registrars to work on analyzing data and producing more outcome studies. 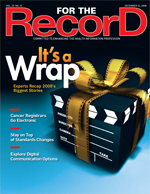 “The advent of the electronic health record and electronic communication provides an opportunity for CTRs to do abstracting from home, a significant benefit which may help attract more people to the profession and help alleviate shortages,” says Joyce Jones, CTR, chief operations officer for MLT Medical Coding, which provides CTRs and other medical professionals on an outsource basis to work on site or remotely. “Of course, they still have to be at the hospital for meetings and management tasks unless they job share with another on-site CTR.” Jones notes that working from home gives CTRs quiet time, so they can focus on abstracting without interruption, provided the home is distraction free. The logistics of connecting from home depend on the hospital’s registry software and EMR setup, explains Jones. For example, in a Web-based system, remote workers can connect from anywhere via the Internet. Other options are logging in through a virtual private network (VPN) or secure site, either directly to registry computers or to the network where the registry database is stored. Utilities such as Webex or GoToMyPC may also work to connect a remote registrar to a computer; however, anyone on site could not be logged into that computer at the same time. IT department coordination is essential in planning and establishing remote connections. Because confidential patient information will be utilized, compliance officers and HIM managers should also be consulted during the planning stages.